The average premium for Part D coverage will be increased by about nine percent to $43.48 for beneficiaries who remain in their current plan next year. The Kaiser Family Foundation has released their results of their deep dive into 2018 Part D pricing and other out-of-pocket expenses that are expected to go up in 2018. 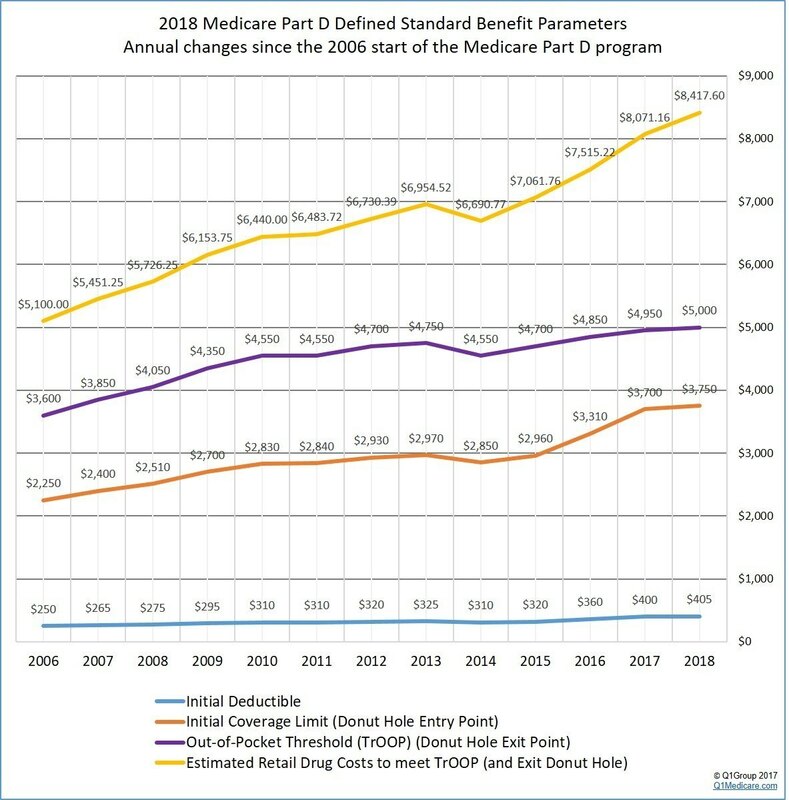 Here we'll take a look at finding lower-cost Medicare Part D for 2018. Although a large number of generic drugs can be had for less than $10, many of the newer drugs are reaching the price of a car payment and some are priced even higher. Medicare Part D (drug coverage) was created to help seniors deal with the costs of medications as many were putting their welfare even more in jeopardy trying to manage the financial devastation that could result if their only answer was to take a medication that is costing about $100 to $150 a pill. Although the folks at Medicare responded, there are still some issues with the Part D coverage that makes “challenging” an understatement. Here we’ll look at the Medicare Drug Plan and discuss the additional costs that come with it. You need to sign up for Medicare Part D at the same time that you enroll in Medicare Part B and when you are enrolling in your Wisconsin Medicare Supplement Plan. Don't procrastinate even if you're not taking any prescription drugs at this point. If you put it off until later on to sign up, you will be charged additional premium for every month that you lingered. Every year beneficiaries should make certain that the medications they will be taking during the year will be covered on their selected Part D plan. Each open enrollment period is a great time to communicate with your physician to make sure that all your prescriptions are medically necessary and also to determine if the medications you do need have recently begun offering generic alternatives. You can bet that your Part D plan will be tweaking their drug coverage as well. According to the Kaiser Family Foundation, a leading organization that provides among other things, in-depth information on key health policy issues like Medicare and Medicaid, almost three-quarters of retirees that pay insurance premiums out-of-pocket​ will experience higher monthly costs for 2018 if they decide to keep their current Part D plan. The only possible way to escape this penalty without enrolling in Part D is if you have equivalent drug coverage, called "creditable" coverage, from another source, such as a retiree plan. Your plan administrator can notify you whether your plan is considered equivalent. Part D | How Much Will I Pay? The average Part D plan costs about $34 a month in 2017 but pricing can fluctuate. Typically, if you purchase a Part D plan with a higher premium, you'll pay less out-of-pocket when you use the plan. Deductibles and copays also play a significant part in your actual cost for medications. Let's not forget that dreaded deductible that has a tendency to creep up as well. For 2018, the deductible will increase $5.00 to a total of $405 although this is significantly less than the $40 smack-down that enrollees suffered in 2017. Typically about half of all Part D plans will charge the maximum deductible amount while the remaining charges lower deductibles or none at all. Remember, the deductible is the amount you pay before the insurer begins paying. It is the amount you choose to self insure. In 2017, the highest deductible allowed is $400. The higher the deductible you choose, the lower your Part D premium will be. Your copayment is a flat amount that you must pay for a medication. For example, you may elect a plan with a $5 copay for generics, $25 for a brand name drug, and then $40 for a non-preferred brand name drug. Typically Part D plans will have five tiers of medications that are covered, and each one has different out-of-pocket costs. The most common plans will include a tier for generics, preferred generics, preferred brand-name medications, non-preferred medications, and specialties. Part D plans will commonly assign copayments to the generic and brand name drugs and then coinsurance (percent of the cost) for non-preferred and specialty drugs. To make matters even more confusing, one year your medication might be designated as a preferred brand tier drug that may require a $40 or so copayment; but the following year it’s designated a non-preferred drug and you have to pay 30 or 40% of the cost which is substantially more than last year’s cost. Your coinsurance is a percentage of the total prescription cost that you agree to pay. Coinsurance is typically required for tier 4 and 5 drugs which are generally very expensive. 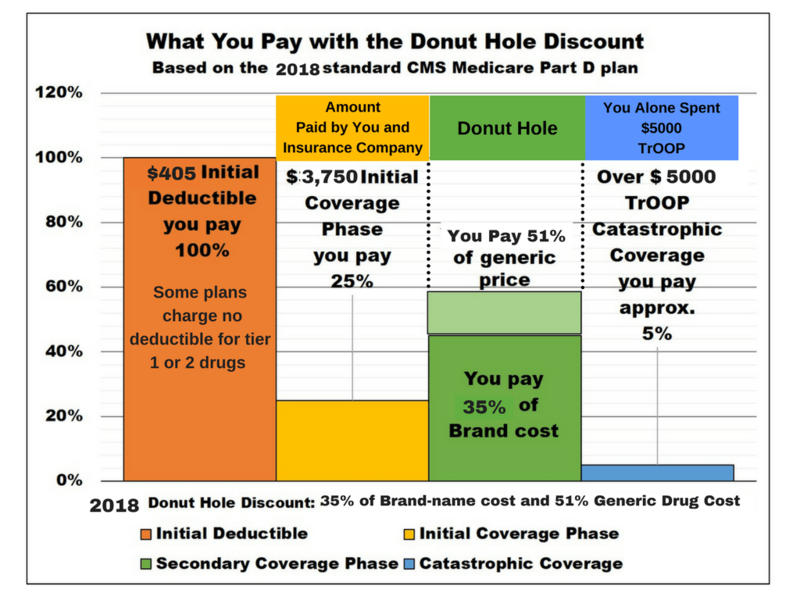 The coverage gap is the stage in your Part D benefit when most Medicare Part D plans cease paying for your prescription drugs, sometimes called the “doughnut hole.” Thankfully, as of 2011, the donut hole has changed. You now will get more help with your drug costs from discounts. For example, the 2017 coverage gap discounts include 49% on generics and 60% on brand name drugs. The coverage gap begins when your total drug costs (what you and your plan pay) reaches $3,700. 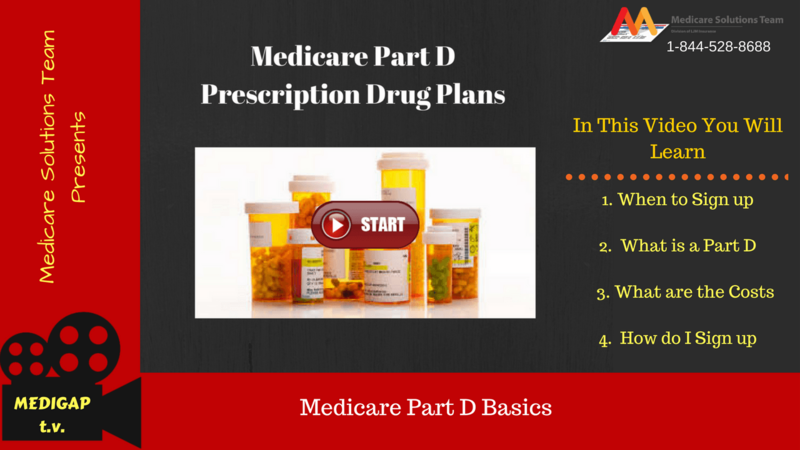 Medicare Part D is the prescription drug coverage that is available to Medicare beneficiaries. This coverage is considered stand-alone insurance and is separate from Part A and Part B. Beneficiaries can purchase a Part D plan from many private insurers and typically premiums are based on the types of prescription drugs that need to be covered (the formulary). Each Part D drug plan has its own list of prescription drugs that they will cover, and that is how the pricing is set. All prescription drugs are divided into tiers which represent the cost of the drugs to the insurance company. The best method to use when shopping for your drug plan is to contact Medicare.gov and provide them with a list of your prescriptions drugs and they will align you with the most affordable drug plan available. Medicare recipients who are shopping their Part D coverage have an average of 23 Part D drug plans to choose from in 2018. Plan choices range from 19 in Alaska up to 26 in Pennsylvania and West Virginia, and yes, premiums vary significantly from one plan to another. In fact, among the ten top drug plans (according to the number of enrollees) monthly premiums range from about $20 per month for Humana Walmart RX to almost $84 per month for AARP’s Medicare RX Preferred. Knowing this, it makes perfect financial sense to shop your Part D plan every year to identify possible out-of-pocket savings. The good news is that many Part D plans have special arrangements with certain (preferred) pharmacies that allow less cost sharing when you use those pharmacies. It’s certainly worth your while to check with your Part D plan company and ask about preferred pharmacy pricing. For more information about your actual cost for prescription drugs under Medicare Part D, call the experts at Wisconsin Medicare Supplement Plans at (920) 545-4884 during normal business hours, or contact us through our website at your earliest convenience.